Can I be Arrested for Giving out Merchandise or Goods for Free? Some stores and shops may have a friends and family deal that employees may use to give out discounts. These are generally approved on a case by case basis by an employer or manager before the employee may begin issuing them. Additionally, there are many retail stores, coffee shops, or restaurants that have an informal system in place. An ex-employee stopping by for a coffee may not be charged, a friend of an employee may be given a deep discount at a bike shop, or a waiter may decide not to charge for that second drink or appetizer. There is a fine line between what an employer deems acceptable and what will result in a reprimand for an employee. When a waiter consistently undercharges customers in order to “give them a deal” so that they repay the waiter with a larger tip, an employer may catch on and take legal action in addition to firing the employee. Every employer is different, though it can be expected that the more items that are given away for free and the larger the employer’s losses become, the harsher penalties you as the employee can be expected to face. And, because employee theft is on the rise, according to Chain Store Age, employers are becoming ever more vigilant and even vengeful towards employees who they believe to be hurting their profits. If you were fired and charged with theft by your employer, the prosecution must show that you are guilty of giving away said items and prove the worth of those items. There are many defenses to such accusations, as there are usually many other employees that may have committed the offense. How can they prove it was you, though? Video recordings, work logs, and eyewitness accounts are generally the most solid legal forms of evidence, and many times these are not present in such cases. Additionally, can it really be proven that you were not abiding by the company’s own policies by accepting a coupon, flyer discount, or other markdown? 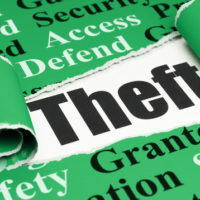 For an employer to successfully charge you with theft, the amount in question must generally be very substantial, as in thousands of dollars. You can certainly beat an allegation of theft that charges that you stole $43 from a restaurant by undercharging a table. Virginia has a very low bar when it comes to grand larceny, which is a felony offense. “Low bar,” is in reference to how little in value the property allegedly stolen can be in terms to be charged with such a large crime. A grand larceny offense will be charged to anyone who has allegedly stolen property worth $200 or more, while petit larceny applies to property less than $200, as per Virginia statute 18.2-95. Grand larceny is punishable by 1 to 20 years in prison. No matter the accusations, it is vital to work with a lawyer. An experienced attorney will work with you to explore every defense tactic and employ an aggressive, sound strategy to ensure that you are not found guilty. Call the Leesburg, Fairfax, Winchester, or Manassas criminal defense attorneys at Simms Showers, LLP at once.